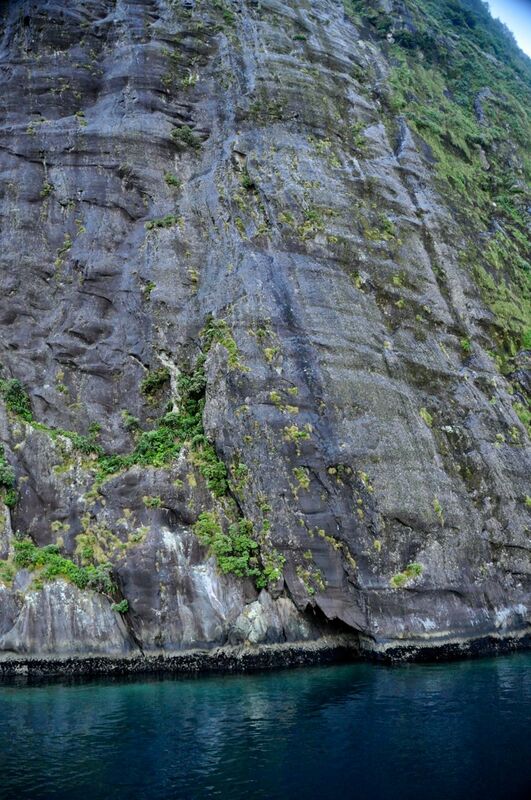 Milford Sound is a famous landmark of NZ. People fly over by plane, or travel by bus or car, or even hike in over the Southern Alps. 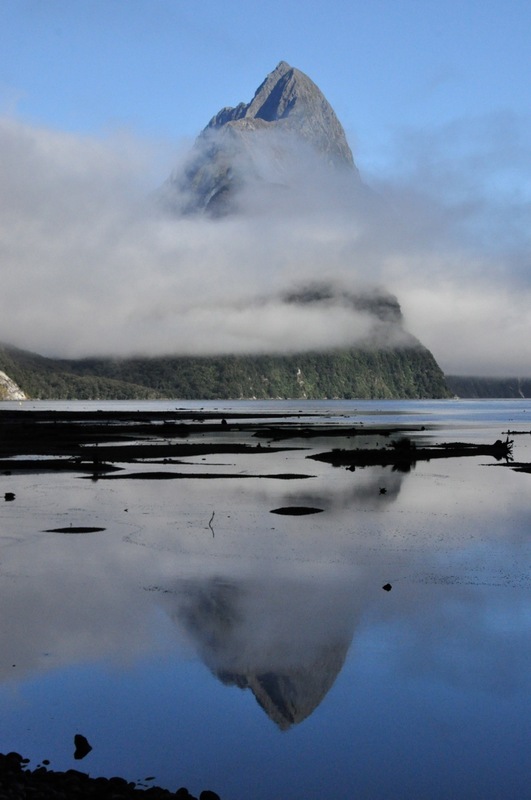 It is said that one needs to see Milford Sound on repeat visits: in the sun, in the rain, and under a blanket of snow. Why one should see it in the rain is not intuitive, but my travel book says that shortly after a big downpour every cliff sports a waterfall (and the place looks even more magical as ethereal mist descends). I say this to lift our spirits, because it is raining steadily, and the “ethereal mist” is pretty damn depressing. I know that the famous and massive Mitre Peak is staring me straight in the face in the left picture, but someone ate it. Still, the view has a somewhat oriental charm to it, just not the OhMyGosh! view I was hoping for. There are some nice views before departing – a white heron fishing, a near-by waterfall – but note my difficulty in keeping my lens dry. The minimalism of traveling does not permit many photographic accessories. A lens hood or underwear, that’s the choice. Finally we’re off, along with 58 other hardy souls looking a little long-in-the-face as well. The boat is nice, although its large picture windows are not going to work for taking good photos from inside. I’ll have to brave the elements outside, and dash inside to clean my lens – along with a lot of other photographers, but everyone plays nice. The first views are certainly atmospheric; big mountains diving straight into the water, and tall waterfalls appearing out of the clouds. In gray. Sigh! For perspective, look at the other cruise ship in the last picture. As we motor out, there certainly are waterfalls! When we get closer to them, there is still some color through the rain and mist, thank goodness. They’re pretty, take a look. Part of what is happening here is the presence of many “hanging valleys”. In the ice age, mile-thick glaciers rumbled cross-wise across mountains and valleys, churning a trough a mile deep. When the glaciers left, leaving nearly vertical cliffs at the trench edges, the rivers traveling down those valleys now had no choice but to hurtle lemming-like off the cliffs into the waiting Sound (fiord). 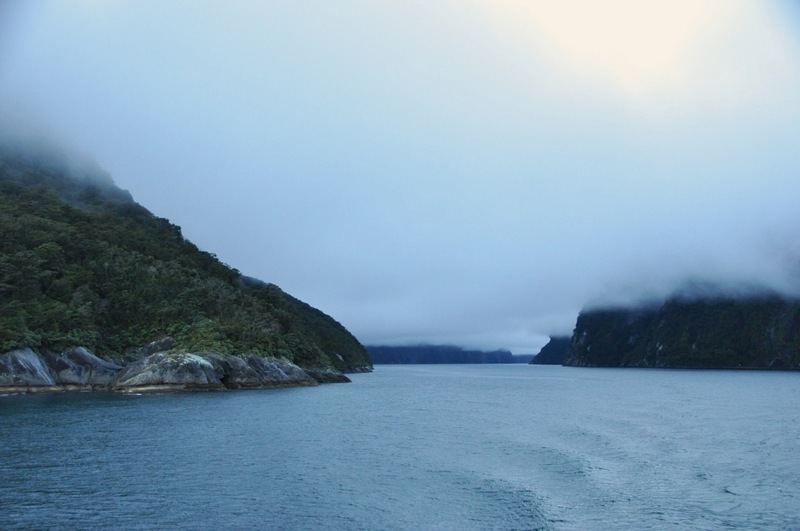 In Milford Sound, only a half-mile wide, the effect is impressive; the peaks, we are told, go up 3000 feet (alas, in the fog we only see about 100 feet of that! ), and the water of the Sound is over 1000 feet deep. Where we float, the sides of the glacier-sheared mountains are near-vertical. What that means for us is that the cruise ships can get within a few feet of the mountainside with no fear of hitting anything, and they do that at the waterfalls with some glee. Which you’ll see below, as we approach a single waterfall. I saw what was going to happen and quickly bailed into the cabin, as did ginger (in the blue raincoat). The prow went into the waterfall; the kid and dad got soaked! And I mean drowned-rat soaked! They were dripping their own cascades as they sloshed into the cabin. There are more waterfalls, which are just everywhere. It’s like the world has sprung a leak. I hope you’re enjoying the beauty of these waterfalls! It’s raining, and I’m having to dash in and out of the cabin to dry my lens. Soon my lens cloth and then handkerchief are as damp as the lens, and I’m just pushing the wet and smear around. Reality is probably clearer than what you see in these pictures – but fear not, the mist and fog you see in the pictures may be augmented by my wet lens, but for sure it is really there! We do another close-encounter with a waterfall, shown below. The waterfall is truly beautiful, but this time everybody retreats at the last minute. No takers to experience becoming one with the waterfall! Which just goes to prove that if history is close enough in time, humanity can learn from its mistakes. That waterfall was a pretty one! Alas, you only get to see the static view; the moving view was so much better, with the changing patterns of falling water and those white trails on the water surface zinging out at us at high speed, almost scarily. 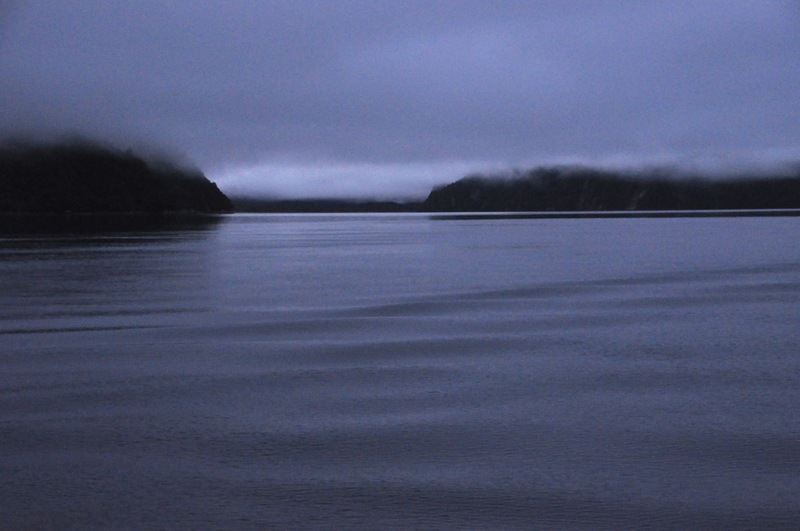 We’re heading for a small bay where we’ll moor for the night – what little light we had is beginning to fade. Surprise, we get to go out and explore before dinner! On the water. A few choose to go out in kayaks by themselves. A couple of young ladies decide to go swimming (!). We, along with many others, choose to go out in small rubber boats with a guide. A good choice! The perspective is slightly different this close to the water, and we get to see some wildlife here at the end of the day – a NZ pigeon (large, beautiful tree-dwelling birds! ), a seal practicing his diving technique, and – lucky us! – a Fiordland crested penguin coming home to his nest! He is very cute as he hops up the rocks to his burrow. The last picture is of our bay as twilight deepens. Well, the day was beautiful in spite of the rain, and the waterfalls were other-worldly, but we are disappointed; the mountains should be towering above us, cathedral-like, for thousands of feet, and we see only glimpses beyond 100 ft up. Our captain says there is a good chance the clouds will lift by morning. We cross our fingers and go to sleep. The late-night passengers take pictures of seals that climb on board at the lower level and sleep on the deck! The morning brings the same low cloud cover. Today we will head first to the mouth of the Sound (the Tasman Sea), and then head for home. There is a chance the clouds will lift for the trip home! In fact, the rain has stopped and things are looking lighter, especially up ahead, and certainly the views are brighter and sharper! As we approach the Tasman Sea, we have clear skies! As in, practically no clouds overhead at all! There is hope! Of course, looking backward, there is still nothing but truncated mountains as far as the eye can see. Can the funk go away in time? As we move further out into the Tasman Sea and look back, the cloud situation is amazingly and frustratingly apparent. In the pictures below, look at those beautiful, commanding mountains towering above the cloud cover! Yes! And look at how thin that layer of low-lying white cloud is! And look at the sun trying to shine through! This could work!! Well, it’s hopeful! As we enter the Sound, the low-lying cloud cover is dauntingly there, but there are also luminous areas where the sun struggles to break through, as shown in the first image below. As we venture further into the Sound, everything gets clearer and brighter. The last image, looking backward, shows real sun shinning on where we were. As we retrace our path of yesterday, we revisit the waterfall close-encounter. The waterfall is definitely a little smaller, but the view is now even more beautiful, the colors brighter, the rocks more clearly defined. It is again a magical view in NZ. As we travel on, it becomes clear that we will not escape our fate of a low cloud ceiling. The funk is lifting behind us, but not in front, and time is running out. It is a little frustrating, knowing how thin the obscuring cloud cover is! We do pass an interesting part of the Sound, where a protruding wall shows the scour marks of the glacier from so many millions of years ago. Showing its age with wrinkles, it is. Well, the weather continues to toy with us as we near our harbor destination; the ever-present cloud cover is getting lighter, but persists, restricting our view to just a few hundred feet up. And then we’re at the Milford Sound Harbor and disembark. We disembark to, of course, the lifting of the funk, at least here. Well, better late than never, I guess. Ladies and gentlemen, we present finally, Mitre Peak in all its glory. OhMyGosh! Just for comparison, let us show you the before (yesterday) and after (today) pictures of the harbor, and you can judge what we missed! The before pictures are the first two pictures from this post. Well, OK, I groused all through this post about what we missed, didn’t I? My apologies. I, of course, wanted it all. Even so, it was pretty spectacular, wasn’t it? Next post – Fiordland and the Routeburn Track!